Six weeks ago, my parents disappeared. When Emma Vaile's parents leave on mysterious business trip, it gives her the perfect excuse to be a rebellious teen. Throw some parties, get a tattoo (or maybe just a piercing), and enjoy the first few weeks of her junior year. Then her best friend stops talking to her, the cops crash her party, and Emma finds herself in the hands of a new guardian--her college-age "knight in J.Crew armor," Bennett Stern--and on a plane to his museum-like mansion in New England. After enrolling at Thatcher Academy, Emma settles in by making friends with the popular legacy crowd. But she can't shake the strange visions that are haunting her. She has memories of Thatcher she can't explain, as if she's returning home to a place she's never been. Emma doesn't trust anyone anymore--except maybe Bennett. But he's about to reveal a ghostly secret to Emma. One that will explain the visions . . . and make Emma fear for her life. This book is told in first person by Emma, a young girl who finally realises she has been abandoned by her family and now her whole world is about to come crashing down on her when she realises she isn't who she thinks she is. In the first few chapters events pass really quickly and we easily get a good grasp of what is going on in Emma's life. I felt like the plot just whooshed in like a wave and swept me off my feet, losing me instantly into the story. This is where I do my typical teenage tantrum ( I know, I am old enough to know better) and scream and shout at bloggers for not insisting I read this book sooner! This is my kinda book! I absolutely adored the plot and the characters and I can't wait to dive into the next book. I really liked Emma. I thought she was a brilliant character and dealt with all the changes occurring to her really well. Her sense of humour had me giggling a lot; I do love books that mix humour with horror. There were lots of sub plots surrounding Emma, where you discover that many people in her life are keeping secrets from her. I loved the way Emma interacted so easily with the ghosts at the mansion; they were just like a new family for her and she treated them with respect. I loved Bennet! He was seriously hot! Like a knight in shining armour, he rode in and saved Emma; it was so romantic, especially as he didn't show any feelings for her to begin with. The plot had me intrigued all the way through, with some shocking twists in the last few pages, making me desperate to read the next one. The descriptions and imagery made it very easy for me to imagine those ghostly visions that can keep you awake all night. If you loved Maureen Johnson's The Name of the Star, you will love this book too. It has dry humour entwined with terror, making this book completely captivating. 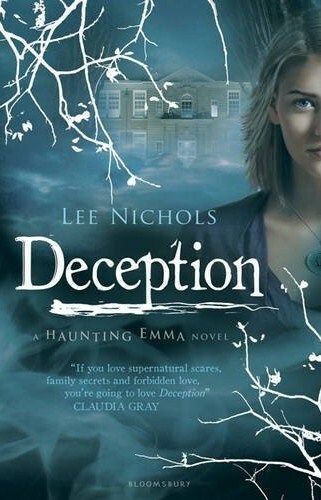 A fantastic debut, I think I am already now a huge fan of Lee Nicholls. My pleasure. I can't wait for the next one. Terrific review! It sounds like my kind of book, too, a mix of humor and horror, and Emma does sound like an appealing character. You've conveyed your enthusiasm for this book quite well, Vivienne.